The CrocsRx line by Crocs features the Silver Cloud, Silver Relief & the Silver Fox. The Crocs Rx Relief is designed to be the most comfortable Crocs that you will ever wear. The "Crocs Relief" has extra arch support so they are great for people with plantar fasciitis. 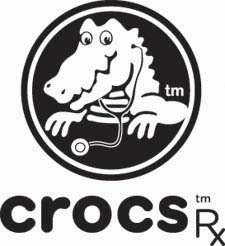 The Orthotic Shop offers free shipping on the Crocs Rx Relief. The CrocsRx Relief is great for people with planar fasciitis, arthritis, heel pain, arch pain, and more. The Crocs Relief model also contains foot bed nubs which provide soothing massage and stimulation. The "Crocs Silver Cloud" is updated in 2010 and is now available in whole sizes. The CrocsRx Silver Cloud is designed for diabetics, people with arthritis and those who need extra cushioning. Crocs Rx Silver Cloud, ideal for ultra-sensitive feet, impaired circulation, impaired sensation. The Crocs Silver Cloud creates an anti-bacterial and anti-fungal environment for the foot as the material is impregnated with silver particles. Ideal for diabetic feet and for feet that require special care. The Silver Cloud is proven to resist mildew and various fungi including trichophyton mentagrophytes (athlete's foot fungus). The Crocs Silver Cloud also accommodates diabetic insoles & cushioned orthotics. Wide base increases stability of each step. Shock absorbing properties minimize load on feet, lower legs, knees, hips and lower back. Roomy forefoot and soft toe box reduce pinch injuries and bunions. Conforms to ASTM F1677 slip-resistance standards. Neoprene top cover that can be shaped and glued to refurbish a pair of custom made orthotics. Sold as a pair. You’ve never worn shoes like these before! Designed for all-day wear, orthotic Crocs RX were built to provide comfort and health benefits. Arch support, strategic ventilation holes and shock absorbing insoles make this slide-on footwear ideal for those with sensitive feet. Distinct treading will help you keep your balance, while the roomy interior of the Crocs RX Silver Cloud prevents pain-inducing pinching. The orthotic crocs assist diabetics with sensitive feet, as well as those with plantar fasciitis or flat feet. Order a pair of your own today to experience first-class podiatric support and sweet relief.